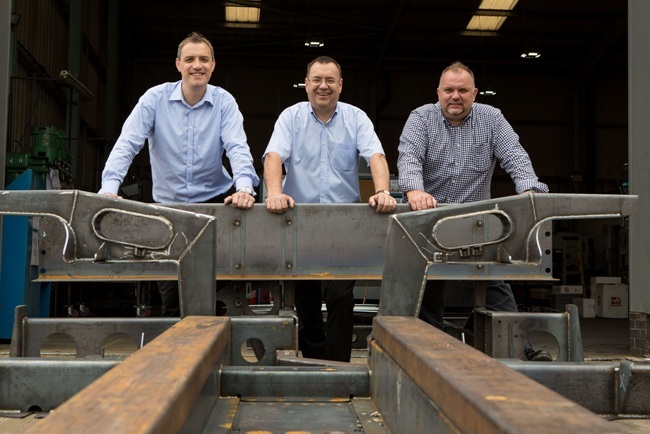 A Sheffield engineering company celebrating its 25th anniversary this month has more than doubled its turnover and workforce in the last five years. Advanced Engineering Techniques (AET) manufactures 600,000 metal components a year for major clients across a range of sectors and has supplied parts for the fleet of London Paralympics buses and the retractable roof over Wimbledon’s Centre Court. In 2008, after the industry was hit by the recession, the firm invested heavily in new plant and equipment and has subsequently seen the worth of annual orders rocket from £4million to £10million, with the number of employees rising from 73 to over 150. AET expects to create a further 40 new jobs within the next five years as it expands further and develops its export business. The company’s growth is being supported by Creative Sheffield – a partner in the South Yorkshire Sector Growth Enhancement Programme (SYSGEP). Creative Sheffield is Sheffield City Council’s economic development function, which is committed to boosting business growth in the city. Creative Sheffield has helped AET to purchase the freehold of part of its site in Holbrook Avenue, Halfway, from the council, which allowed it to secure funding for expansion. Creative Sheffield also introduced the company to both the opportunity to secure a Regional Growth Fund grant from Sheffield City Region’s Local Enterprise Partnership to invest in new machines, and to UK Trade & Investment for export support. “Success hasn’t come by accident. When the bottom fell out of engineering, we didn’t panic. “We sat down and planned what we were going to do. That meant being bold and exciting and investing in the latest technology and techniques, and expanding factory space to increase capacity. “One of our greatest strengths has been that we’ve diversified and can offer the total range of engineering services, which puts us into a very small group of companies. “We’ve also invested in apprenticeships and staff training to maintain the competitive edge in terms of skills. David founded AET with brothers Jack and Reg Copeland. Operations started with one laser-cutting machine in a 1,000 square feet unit. Following purchase of the building next door, factory space has burgeoned to 70,000 square feet. David became managing director in 2003. In 2013, he was joined by new directors Stephen Woollen, sales director, and Andy Richards, operations director. Both have been with the company for about 20 years. Reg is still currently active in the business. Jack sadly passed away in 2011. The company mostly works with steels. Laser-cutting is still at its heart, allowing for production of complex parts quickly. Other services include press-braking – a process of folding metal – milling, sawing, specialist fabrications and finishing and assembly operations. Most people will have come into contact with a product made by AET as it supplies several sectors, including road and rail, coach and bus, construction, defence, agriculture and energy. It provided specialist fabrications for the roofs at Wimbledon and Heathrow Airport’s Terminal 5. The company made conversion kits to turn 300 buses into wheelchair-friendly vehicles for the 2012 Paralympics and also supplied equipment used in lifting challenges in the ‘World’s Strongest Man’ contest. Clients are mostly in the UK but also in Europe and the US and Canada. Increasing export to North America and Malaysia is an area being targeted for development, with plans to possibly set up a manufacturing facility overseas. “The support we’ve had from Creative Sheffield has been very helpful. “Sheffield has been renowned for engineering excellence for over 200 years, and is recognised worldwide for its expertise in high precision engineered materials and manufactured products. Creative Sheffield is part of Sheffield City Council and is the city’s economic development function, with business growth its core activity. It is funded by Sheffield City Council and is a partner in the South Yorkshire Sector Growth Enhancement Programme (SYSGEP) that is part-financed by the European Regional Development Fund through the Yorkshire and The Humber ERDF Programme 2007-13.